In the winter edition of CIJ Trends & Colours, our annual trends tracker guide, we talked about the top ten trends in fine jewellery for 2013 as well as the top ten colours in fashion for Spring 2013 as forecast by the Pantone Fashion Color Report Spring 2013. 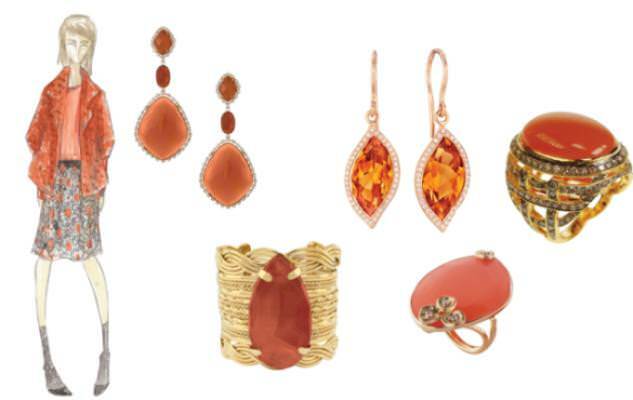 On these pages, we continue with a look at the versatility of jewellery and how many of this year’s pieces so closely align with Pantone’s main fashion colour directions for Fall 2013.
to sparkle and fascinate, bringing luxury and elegance to the palette. Hervé Léger by Lubov Azria using Pantone Linden Green. This colour brings a lightness and brightness to the deeper shades of fall. Tadashi Shoji using Pantone Vivacious, an unruly and wildly deep fuchsia, which adds an ebullient sensuality to the palette. Steven Alan using Pantone Carafe, a rich, glamorous brown that pairs gracefully with more expressive colors within the palette. Rachel Roy using Pantone Samba, a red offering an expressive and dramatic look. Jenny Packham using Pantone Mykonos Blue, a bold, meditative blue, for a classic and relaxed Fall look. Lela Rose using Pantone Koi. A decorative orange with dazzling and shimmering qualities, Koi is a statement color that serves as a pick-me-up for your wardrobe. Pamella Roland by Pamella DeVos using Pantone Deep Lichen Green, a naturally lush shade of green. Trina Turk using Pantone Acai, an exotic colour that adds mystery and richness to the palette, and can be incorporated with the other colours to create a number of powerful Fall combinations. Tia Cibani using Pantone Turbulence, a dark mercurial gray, with a touch of Carafe, a rich, glamorous brown. These neutrals provide more interesting and sophisticated alternatives to the black basics usually worn in colder months. Fashion sketches and colours are courtesy of Pantone Fashion Color Report Fall 2013.